When it comes to your dog, your goal is to ensure that you are providing him with the very best of care. After all, he’s more than just a pet; he’s a member of your family. Just like any other member of your family, you go to great lengths to offer him the best products to make sure that he is happy and healthy. He sleeps in the most comfortable and supportive dog bed, you use the most secure dog collar and dog harness for those daily walks, and his toy box is filled with the fun and interactive dog toys. While all of these products are super important for the health and well being of your canine companion, there’s one product that is more important than all the rest: his dog food. Just like humans, dogs need to be fed a well-balanced diet that meets their nutritional needs. You also want to ensure that the food you are filling your furry friend’s dog bowl with is palatable so that he can get as much enjoyment out of eating as possible. You probably don’t enjoy eating food that doesn’t taste good, and the same is true for your dog. At first glance, choosing food for your pooch might seem like a pretty easy task. You just walk into a pet supply store or the grocery store and select one of the endless options that line the shelves. However, in reality, select the best dog food brand is a bit more challenging than it seems. There are so many different brands to choose from, and like everything else, not all brands are the same. Many dog food brands are sub-par and simply don’t meet the nutritional needs of your pet; and in fact, many options contain ingredients that can actually be harmful to your furry friend’s health. With that said, to help you select the best dog food brand, we’ve done extensive research to compare the different options on the market. Based on our research, we have narrowed down the options and compiled a list of the top brand dog foods. Each option is made with premium ingredients to ensure that your pup is receiving the very best nutrition; and to also ensure that his food is tasty and enjoyable. Now that you’ve had a look at our top dog food brand list, let’s take a closer look at each one. Below, we provide an in-depth overview of each top brand dog food. In these reviews, we share what ingredients are used in each formula, why these brands and foods are highly regarded, what benefits they offer, and what we – and other pet parents – like about them. After you have finished reading through the reviews and decide on an option that will best meet the needs of your four-legged family member, click on the buttons to find the best prices currently available on Chewy and Amazon. First up on our list of the best dog food brands is Blue Buffalo dog food. The company is US based and owned and operated by the Bishop family. The makers of Blue Buffalo are animal advocates and pet lovers. The family believes that pet parents don’t “own” their canine companions; but rather, that canine companions are truly members of the family and as such, they should be treated with the utmost love and respect. The makers of Blue Buffalo decided to start making dog food after their dog, Blue, was diagnosed with cancer. It was Blue’s illness that sparked the Bishop family’s interest in creating a wide range of dog food formulas in order to suit the needs of dogs of all ages, size, and lifestyles. For example, they make dog food for sensitive stomachs, dog food for allergies, food for small dogs, and food for large dogs. In order to meet the needs of pets, the Bishop family uses only premium quality ingredients in their food. All recipes contain premium cuts of real animal meat as the first ingredient in order to ensure that canines are receiving the best possible protein; examples of the protein sources that can be found in Blue Buffalo formulas include free range chicken, turkey, bison, venison, and beef. Other key ingredients featured in all Blue Buffalo recipes include a variety of high quality fruits and vegetables, such as sweet potatoes, peas, potatoes, blueberries, apples, cranberries, and pumpkins. These ingredients aren’t just chock-full of essential vitamins and minerals, but they are also easy to digest and won’t cause adverse reactions, like stomach upset or skin problems. Another reason why Blue Buffalo is so highly regarded is because all of their dry dog food formulas contain Blue’s exclusive Life Source Bits. These bits are designed by holistic veterinarians and contain a premium blend of essential antioxidants, vitamins, and minerals to ensure that dogs are getting the vital nutrition that they need. Blue Buffalo consistently ranks as one of the best manufacturers of dog food. All of their products are made in the USA in facilities that adhere to the most stringent quality assurance regulations. Countless parents are avid users of Blue Buffalo and many veterinarians highly recommend the products this manufacturer makes. If you’re looking for a premium quality dog food that you can have confidence in, you’ll have peace of mind when you feed your canine companion Blue Buffalo. 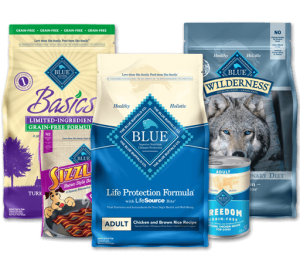 Final Verdict: If you are looking for a premium quality food for your pooch, Blue Buffalo is one of the absolute best dog food brands on the market. Taste of the Wild dog food is another option that many pet parents swear by. The name of this food perfectly describes what it is all about: foods that are made based on dogs ancestral diets. 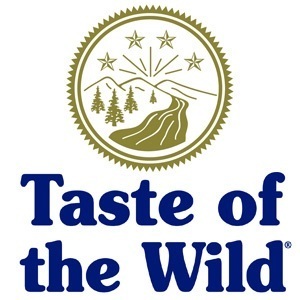 Taste of the Wild is another US-based family owned and operated company, and according to them, that’s exactly what they will always be. The makers of this food are pet owners that were very unhappy with the food options that were available for their dogs. They found that there were no options that were based off the DNA needs of pets. That’s why they created their food, which is inspired by the diets that ancestral canines consumed: all natural ingredients, like meats, fruits, and vegetables. Their goal is to provide balanced nutrition that is inspired by nature in flavors that are highly palatable and appealing to their “inner wolf”. Taste of the Wild is one of the best known and most highly regarded brands of pet food in the world. They pride themselves on offering premium quality foods and are committed to creating formulas that pet owners can have confidence in. This brand makes a wide range of formulas to suit the nutritional needs of dogs of all ages, sizes, and lifestyles, and to meet the special nutritional needs that all canines have. Some of their recipes include high protein dog food, low sodium dog food, wet dog food, and low protein dog food. All of their food is made in the USA in their state-of-the-art facilities, all of which adhere to the highest quality control standards. Most of the reviews that we read suggest that pet parents are very happy with Taste of the Wild products, and many of the veterinarians that we spoke with highly recommend this brand. Final Verdict: We are very impressed with Taste of the Wild dog food. It’s made with premium quality ingredients to ensure that the nutritional needs of all dogs are being met. Pet parents have been trusting Purina dog food to meet the nutritional needs of their canine companions for more than 100 years. The makers of this food are committed to providing dogs with the best possible nutrition, and they achieve their goal by using only the best possible ingredients. They also offer a variety of formulas in order to ensure that the dietary needs of all pets are being met. Some of the options that Purina One offers include grain free dog food, dog food for weight loss, and puppy chow. 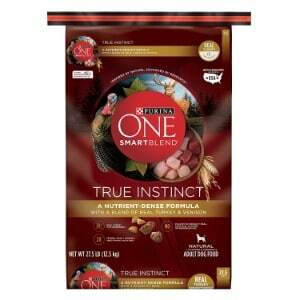 As mentioned, Purina One uses only the best possible ingredients in their formulas. These ingredients include animal-based proteins, which are always the first ingredient, such as turkey, chicken, beef, and venison. They also use real fruits and vegetables in their foods, which helps to enhance the nutritional value and boosts the flavor. And, to ensure that their dog foods are perfectly balanced, they are fortified with essential vitamins, minerals, and other vital nutrients, such as glucosamine, omega 3 and omega 6 fatty acids, and antioxidants. All Purina One dog food formulas are made in the safest facilities that abide by the most stringent quality assurance standards. While this brand is very trusted and high quality, it is important to note that a lot of the recipes that they make do contain grains, such as corn, wheat, and soy. With that said, if your dog is sensitive to grains, then you might want to consider another brand, or just make sure that you carefully inspect the ingredients to ensure that you choose a formula that doesn’t contain corn, wheat, or soy. Final Verdict: If you’re looking for a high quality dog food brand that won’t break the budget, Purina One is an excellent option to consider. However, do make sure that you read the ingredients if your pup has sensitivities to certain ingredients. Another one of the best dog food brands on the market is Rachel Ray Nutrish dog food. This food is made by celebrity chef and television personality Rachel Ray, who is a huge advocate of dogs. Ray has long been a pet parent herself and she was inspired to make a dog food line after her beloved Pit Bull Terrier passed away. She collaborated with Ainsworth Pet Nutrition, a well known manufacturer of dog food, and the team decided to join forces and create what has now become one of the best loved dog food brands in the world. What really sets Rachel Ray’s line of dog food apart from the other best dog food brands is that her formulas are actually inspired by some of her favorite recipes. For example, some of her wet dog food options include Beef Stroganwood, Chicken Muttballs with Pasta, and Hearty Beef Stew. She also offers foods that meet the nutritional needs of all breeds, including Huskies, Pugs, Newfoundlands, Jack Russell Terriers, Dobermans, Dachshunds, French Bulldogs, Gold Retrievers, and even pure-bred mutts. All of the Rachel Ray Nutrish formulas are made with premium quality ingredients. Real meat is always the first ingredient, and each recipe contains fruits and vegetables, and is infused with essential vitamins and minerals, as well as a host of other nutrients. Most pet parents are very happy with this brand of dog food and say that their canine family members’ gobble it right up. Final Verdict: For a premium quality pet food, Rachel Ray Nutrish is an outstanding option to consider. The manufacturer offers a variety of formulas that are suitable for dogs of all ages, sizes, and lifestyles. Rounding out our list of the best brands of dog food is Merrick. Merrick dog food has been around since 1988, and since then, countless pet parents have been counting on this brand to meet the nutritional needs of their pets. First, the company was small and they specialized in making all natural dog treats; however, they eventually started offering high quality dog foods, too. The makers of Merrick dog food believe that canines should receive the best food possible in order to ensure that their nutritional needs are properly being met. With that said, their entire line of products are made with natural ingredients that have been sourced from local farmers and truly reputable suppliers. Furthermore, all of the ingredients that they use are approved by the FDA. This manufacturer offers an extensive line of dog food products, including options that meet the needs of small breeds, large breeds, adult dogs, senior dogs, and puppies. They also offer options for canines that have specialized dietary needs. Real animal protein is always the first ingredient in their food. Additionally, all formulas contain real fruits and vegetables, like green beans, apples, carrots, peas, blueberries, and sweet potatoes. Lastly, their products are infused with vital nutrients, such as glucosamine, omega fatty acids, amino acids, and zinc. And, each formula that they make is grain free, so if your pet is sensitive to grains, Merrick is an excellent option to consider. Final Verdict: If you want to ensure your pet is receiving the best nutrition possible, Merrick dog food is a great option to consider. Made with all natural ingredients that have been sourced from the most reputable suppliers, you can be sure that your furry friend’s nutritional needs will be met. Being a pet parent is a big responsibility. Your dog is relying on you to make sure that all of his needs are being met, which includes, of course, his nutritional needs. While shopping for dog food might not seem like a difficult task, given the fact that there are so many different options to choose from, it can actually be a bit tedious. To further complicate matters, not all dog food brands are the same. Unfortunately, many do contains sub-par ingredients, such as animal byproducts, fillers, additives, preservatives, and artificial colors and flavors that can be very harmful for your pet. For these reasons, it is very important that you select a premium quality dog food brand to ensure that your four-legged family member’s needs are being met. How did we narrow down the choices? What type of features should you take into consideration when selection a dog food brand? In this section of our review, we’ll answer these questions so you can make the best choice the furriest member of your family. Given the fact that there are so many dog food brands out there, we enlisted the help of veterinarians and animal nutritionists to help us narrow down the options. Together, we reviewed the ingredients in countless brands, we read through dozens of reviews, and we also checked into product recalls. Based on our findings, we were able to narrow down the options to the five brands that are featured on our list. Always make sure that you read the ingredients. Real animal protein should be the first ingredient listed. The food should also contain a variety of fruits and vegetables, and be infused with essential vitamins and minerals. Look for red flags. If you see any artificial flavors, colors, byproducts, preservatives, or other harmful ingredients, stay away. These things can be very harmful for your pet. Read reviews. Reviews can tell you a lot about a dog food brand. Based on the reviews that we read, we found that the majority of pet parents were happiest with the brands that are featured on our list.